Dinner Meat and potatoes tossed with fresh greens  you’re done and happy! Boil the potatoes in a pan of salted water for 15 to 18 minutes, or until tender. Plunge into ice cold water, drain well and cool. Slice the potatoes 1/4-inch thick. Heat the canola oil in a large skillet; cook the potatoes and sausage until the potatoes are golden on both sides and the sausages are cooked through, about 8 to 10 minutes. Season to taste with salt and pepper. Add the tomatoes and saute briefly. Remove skillet from heat source and cool slightly. Slice the sausage into bite-size pieces. 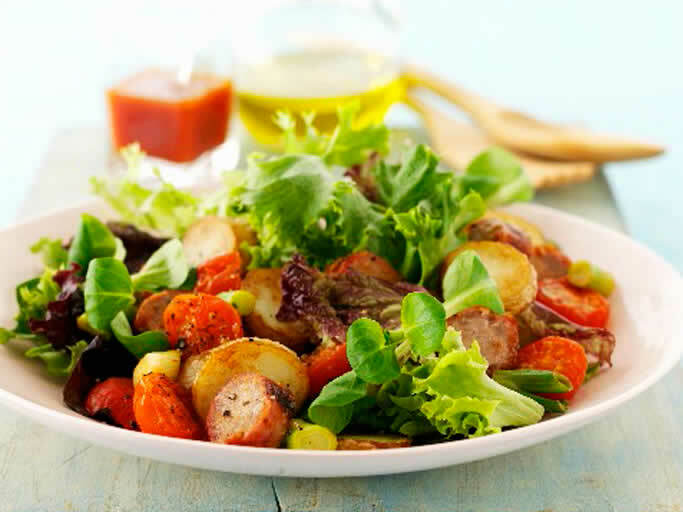 In a large bowl, combine the salad greens, potatoes and sausage mixture. Drizzle dressing over the salad and gently toss. Divide among serving bowls. For Dressing: In a small bowl, whisk ingredients together until incorporated.